By that I mean, I'm back to Slovakia from Oxford - now I will have more time to deal with our little brain-child. It would be a shame to abandon this blog, wouldn't it? 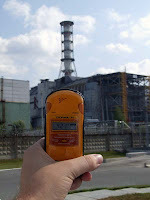 Anyways, one of the reasons why there was no post lately was the lack of actual developments regarding the Chernobyl trip. Up to a couple of days ago. About a month ago I made contact with a very nice lady from Ekotect, and agreed on the price and conditions of sale of a dose/dose rate meter. I told her, that I will have time to actually sort out the payment in december. Well, she did not forget about it either - so contacted me before I had a chance to do the same. Riht now we are negotiating the details, so the whole Chernobyl project is back on tracks again - assured by my travelling / blogging companion Danex as well.